Natural and organic skincare can be a hit or miss. Sure, using products with good-for-you ingredients is great, but when it comes to efficacy, the offerings can be underwhelming. But Acure Organics is far from underwhelming. The family-owned brand only uses sustainable, fair trade and organic ingredients, like chlorella, argan oil and stem cells, that are clinically proven to work. We can’t get enough of the benefits of argan oil, and luckily, most of Acure’s products have the ingredient in them. These biodegradable towelettes are gentle on skin, but tough on dirt, oil and makeup. This scrub is like a green juice for your face. It’s made with organic sea kelp and lemon peel to exfoliate, and French green clay to clear your pores of all impurities. Plus, organic chlorella growth factor and argan stem cells stimulate cell growth and repair, while Madonna lily stem cells leave you with a radiant complexion. It’s almost hard to believe how quickly this body lotion absorbs into skin. Once it sinks in, ingredients like gotu kola stem cells, resveratrol probiotics, chlorella growth factor, argan oil and cocoa butter work to firm and hydrate your bod. Other amazing Acure Organics products include the Day Cream ($16.99), Night Cream ($17.99), Stimulating Body Wash ($9.99), Facial Toner ($12.99), Moroccan Argan Oil ($12.99), Eye Cream ($15.99), Sensitive Facial Cleanser ($9.99), Firming Serum ($19.99) and Moroccan Argan Oil Stem Cell Shampoo ($9.99) and Conditioner ($9.99). And with prices like that, you won’t feel guilty when you buy it all. 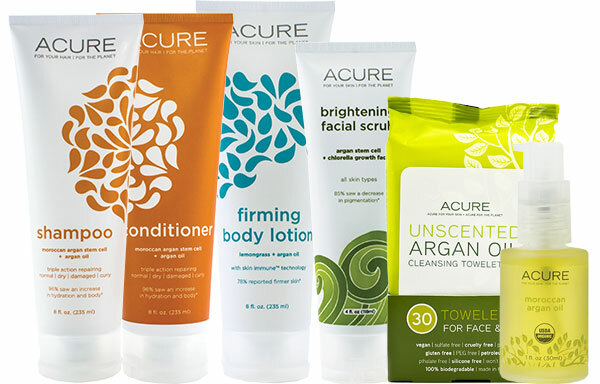 Acure Organics is now available at Target stores and Target.com, but check out AcureOrganics.com for even more organic beauty that you won’t find at the mass retailer.